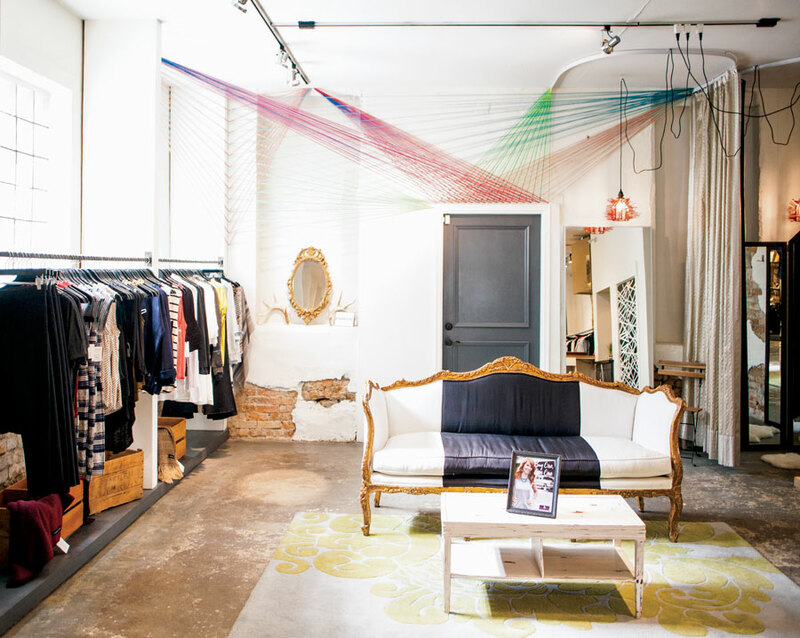 Three years after it moved to Minneapolis’ North Loop neighborhood, women’s clothing store Roe Wolfe recently relocated to the former home of designer boutique Arrow. Roe Wolfe owner Ashley Kilcher was quick to jump on the plum location, situated just two blocks away from its previous address. Just down the street from hotspot eateries Spoon & Stable and the Bachelor Farmer, the site offers all the amenities of North Loop—walkability and its concentration of chic restaurants, cafes, and shops—minus the hubbub of its previous location on Washington Avenue. Kilcher has maintained the space’s raw brick walls and cement floors as well as most of Arrow’s fixtures. (If it ain’t broke, don’t fix it.) To give the store a more contemporary, less minimalist vibe, she incorporated antler chandeliers, gilded mirrors, and vintage trunks. She also tapped her friend, knitwear designer Kevin Kramp, to add some colorful installations to the space—pendant fitting room lamps wrapped in red zip-ties, a bright yarn mural spider-webbing across one corner of the room, and an interlocking tape design decorating a wall. Roe Wolfe, which first opened in Mendota Heights in 2011, features a more accessible range of clothing than the high-design Arrow, with brands including BB Dakota, Maison Scotch, and Free People, plus jewelry by local lines Larissa Loden and Tess and Tricia. With the new location also came some new additions: Eleven Paris tees and separates, Cheap Monday jeans, and fair-trade handbags by Minneapolis-based brand Lion Heart Girl. The store also carries a selection of skincare and beauty products (Kilcher is a skilled makeup artist) including a new locally made natural skincare line called True Hue, which makes a delicious-smelling coffee body scrub and orange juice–infused facial moisturizer.